1) I did NOT purchase this. So obviously, it’s not my fault. 2) I have never worn this in public…except for that one time I wore it in public…to pick up a stranger Alex met on the bike trail. BUT DON’T WORRY. I turned it inside out at a stoplight. So then I just looked like a crazy person who wore her shirt inside out. 3) For the purposes of this particular blog, I will be replacing the questionable word with other, more appropriate, insults that start with the letter B. 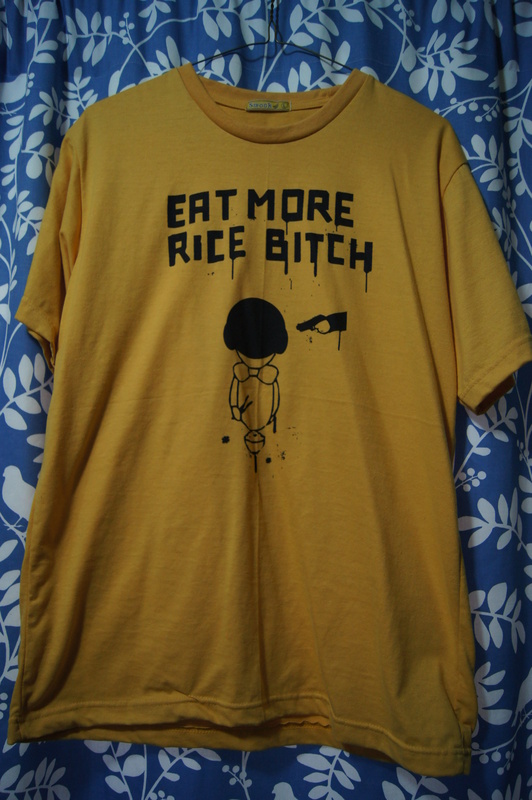 This particular shirt really hits home for me because, if you know me at all, you know my love of rice. You see, I go through these food phases where I could literally eat the same thing every day and not get tired of it. In middle school, every lunch was a bologna sandwich (much to the dismay of my poor locker partner. Sorry, Amy! I hope you still have some of your nose hairs!) In early high school, I went through a period where it was tomato soup. Every day. THEN, I discovered cheesy rice. Ah, cheesy rice. Delicious rice (usually cooked with a bullion cube) topped with shredded cheese. This little obsession carried on over into college AND my married life- meaning I ate cheesy rice at least 4 times a week for at least six years. I even snuck a water percolator into my dorm room my freshman year so that I could enjoy cheesy rice in the comfort of my 12×12 cinder block room. Hold up, doc. You wanna say that to my face? I was mildly offended at her choice of words and even more dismayed by her suggestion of how I get my blood back to flowing like the eternal waters. She wanted me to do that mini-meal thing where you eat small meals 15 times a day. Too bad I 1) don’t have enough time to pack even one lunch, much less fifteen and 2) I was working in a school environment, where I would have literally had to detach the children from my body so I could sit and eat my apple slice while they sneezed and breathed on it. Incidentally, that doctor also told me that I needed to do chest presses so I could (ahem) lift the ladies, which translates into me dumping her. Accusing me of sludge-blood and sagginess at the ripe age of 23 takes it too far, madam. My next attempt at a doctor was an ancient old man whose only appeal (and I mean ONLY) was that he was close to my house. Every time I went, I waited at least 45 minutes past my appointment time and they never could seem to figure out why my blood pressure was so high. I even threatened (in my head) to leave and cough on everyone on my way out. The last straw was when my ringworm flared up again (thought it was scabies) and I went in to get meds. He brought out the Compendium of Rashes and plopped down in a chair next to me. I know he didn’t mean to, but the page he showed me also happened to have pictures of genetalia with rashes on it. You just can’t come back from that (combined with the horrific wait times), so I dumped him too. Do you see the pattern here? All of MY foods are carby, which means I’ve met the 80 grams/day requirement before I finish breakfast. It was quite a shock. I’ve slowly but surely been learning to eat more meat and veggies and eat less carbs and fruits. My friend Rebekah’s site has helped, since she introduced me to Greek yogurt, which I totally eat for breakfast now. But really? I probably eat around 150 carbs a day. So…I didn’t follow her wishes exactly but her just saying that I need to eat less made me think more about what I was eating. Just got my blood tests back and my ‘glcerides are down (ALOT), so no more sludge-blood for this girl! 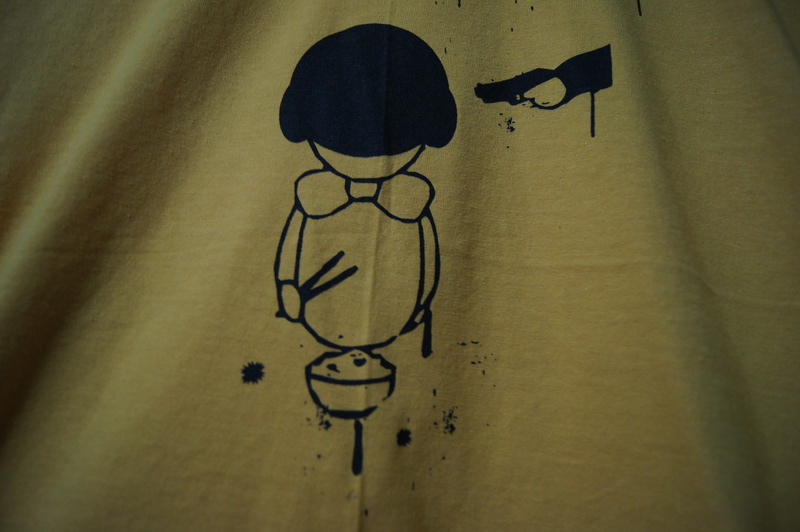 Poor toreador Pat is obviously distressed by the rice and the bow tie. How many times do we know something is bad for us but we do it (or use it) anyway because we give into peer pressure or Satan has tricked us into thinking we can’t live without it. Feel free to also substitute your own imperatives. Gossip about that lady with your coworkers, Barbie. Get angry about your husband not picking up his things, bran eater. Call that idiot driver an idiot, buck teeth. Think you’re better than them, bulldozer thighs. Watch more TV (to the exclusion of other things), braceface. I get into these “hostage” situations quite often, as most people do, I’m sure. It seems especially hard for me to break bad habits. I need to work on my perseverance and not give in so easily. It’s like my brain controls me or something. Luckily, I know jujitzu and I can break my brain’s wrist with the flick of a finger. (Camera pans dramatically across an abandoned factory, where Pat sits helpless, eating a bowl of rice as his blood thickens like tomato basil soup, and Meathead watches, threatening Pat with death.) The factory is completely silent until BOOM, the front door bursts open and through the backlighting of the street, Jesus appears. “No more rice, Pat. I’ve come to rescue you from this thugette who wants to destroy you. You’re done, Meathead.” Jesus bites Meathead on the stomach and stabs her in the neck with a sharpie and then carries Pat to safety…until next time. Choosing to follow Jesus and fight the Meatheads is a daily battle. See, Jesus resucing Pat doesn’t mean that Pat is free from tempation for ever. On the contrary, the very next day, Pat is free to wander back into the arms of the next carbohydrate queen. In fact, I can almost guarantee you that Pat will fall again and Jesus will have to rescue him…again. Pat is human- just as we all are. How does Jesus resuce us? 1) He gives us other people to help us combat the temptation that is happening in our lives. 2) The Holy Spirit reminds us and encourages us to fight temptation through Scripture. 3) With practice, we can learn to recognize when we are sliding into sin and stop ourselves. We mess up. Every day. The crazy thing is that Jesus knew that we would and chose to die for us anyway. That’s why His love is so amazing- every one gets it and no one deserves it. Tags: gettin fit, jesus, t-shirt, thug. Bookmark the permalink.